Data centers’ high energy consumption make them ideal candidates for solar, slashing operating costs and lowering carbon emissions. It’s estimated that by 2030, data center’s demand for energy will increase up to 10 times its current levels, equaling 13 percent of global electricity consumption. Fortunately, major data center operators say slashing CO2 emissions is a primary goal. Solar power electricity generation pricing is the cheapest electricity you can get every day at 12 noon in many places across the country. Much of that price drop is driven by more efficient solar modules, cheaper and smarter inverters, as well increased levels of productivity. Some of the largest users of data centers are companies you have probably used recently, such as Amazon, Google, Uber and Facebook. The brains of these companies are in “the cloud,” which are not water and air, but buildings, machinery, and people who construct and manage it all. Google has data centers in 21 states. Facebook has nearly 15 million square feet of data center space completed or under construction, with several million more feet in the planning stages. Electricity is the fuel that runs these data centers. Power use at data centers in the United States has grown at about a 4 percent rate annually since 2010 and is expected to hit 73 billion kilowatt hours by 2020, more than 1.8 percent of the country’s total electricity use, according to the Energy Department’s U.S. Data Center Energy Usage Report. These centers contribute about 2 percent of the world’s greenhouse gas emissions. Data Center Frontier reported that renewable energy has become a key component of Facebook’s data center projects. 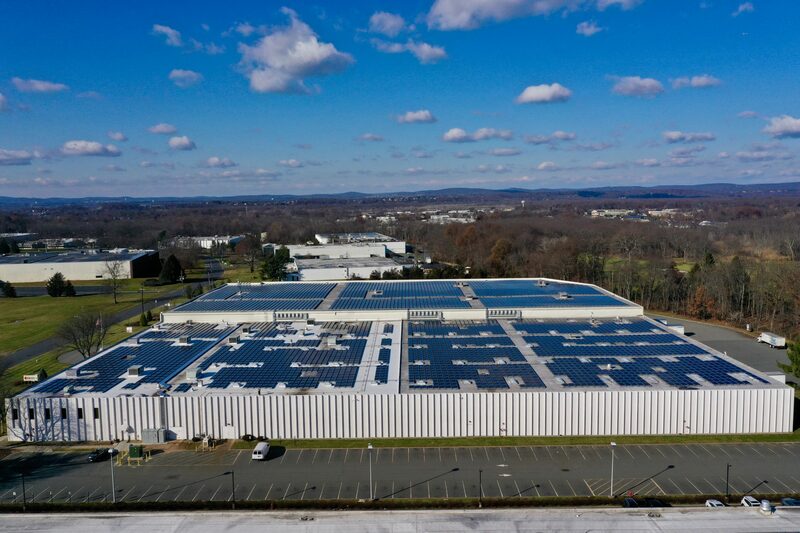 Amazon’s rooftop installation in Edison is one of 19 the company has in North America, with a goal of 50 installations worldwide by 2020. Google is the world’s largest corporate buyer of renewable energy. There are measurable financial and environmental benefits for businesses that transition to solar power. By 2050, it’s expected that wind and solar will produce half of the world’s electricity. Partly, this is due to solar panel installation costs dropping by more than 70 percent over the last eight years. Additional factors are breakthroughs in the efficiency of solar panels, better energy storage technologies and stronger awareness of traditional energy’s environmental impact. Renewable energy costs are stable because there is virtually no recurring cost. Solar can save companies hundreds of thousands (if not millions) of dollars and has a return on investment of just 3-5 years. Many states offer solar rebate programs. For example, New Jersey provides Solar Renewable Energy Credits, allowing businesses to sell excess energy to electric generators. NY, and more recently MA, directly compensate system owners based on system size. Data center owners are also eligible for Federal income tax credits, and accelerated (year 1) system depreciation. When added up, these incentives can be used to cover 45%-80% of the overall cost. Data centers meet the key criteria for solar. Many data centers operate 24/7, leading to high energy bills. They also usually take up a large footprint, which means plenty of roof space for solar panel installation. Solar panels won’t disrupt the operation of the facility, since panels are installed in underutilized space. A solar system also increases the life of the roof, and the value of the property. Many companies retain a solar energy broker to help save on solar panel prices and maximize the incentives. Brokers take on the heavy lifting of getting through the transition to solar energy, including the initial site visit, financing and all phases of installation. There is evidence that businesses that use renewable energy receive also are meeting new customer expectations and demands. A report from RE100 says that “Companies sourcing renewable electricity outperform their rivals financially.” It has become commonplace for RFP’s to include requirements regarding a facility’s environmental targets. Companies that switch to solar have a positive story for the press, offering a clear competitive advantage. Commercial solar panel installation proves to tenants that you’re investing in the future of the property and care about the environment. By adding a solar system to the building, data centers are more likely to produce higher rents and/or lower vacancy, according to the Department of Energy. Helping to push businesses into the world of sustainability, New Jersey and New York’s governors have mandated that 50 percent of all electricity consumed come from renewable energy sources by 2030. One thing we can count on is that the sun will continue to shine. A commercial solar system will keep producing power, dramatically reducing or even eliminating energy bills and working towards reducing carbon emissions. Yaniv has been in the solar energy industry for 10 years. During his career, Yaniv has originated, financed and developed dozens of solar PV systems in the commercial and industrial space. Prior to founding SolarKal, Yaniv has built and led the solar energy division for UGE – a publicly traded renewable energy solutions provider. Prior to UGE, Yaniv led business development and project finance for IPPsolar – a leading solar energy developer based in NY. Before his MBA, Yaniv was a mechanical engineer, designing hydraulic tracking system for solar CSP plants. Besides solar, Yaniv is a Boston Consulting Group Alum and holds an MBA from Columbia Business School.